Twelve feet tall and covered in red clay bricks that come from one of the oldest kilns in the region, the structure at Pacific Birth invites visitors to journey to its center and see the shining pearl up close. 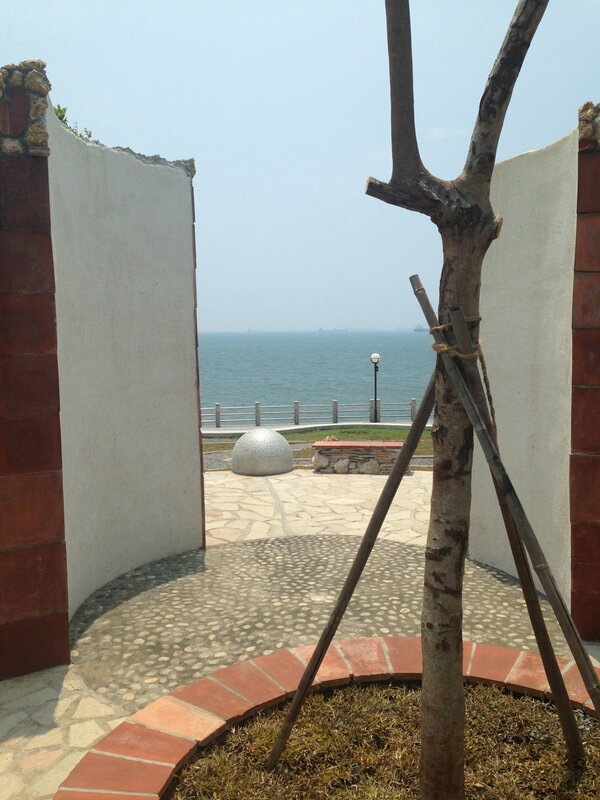 “Pacific Birth” is located in Cijin, a small coastal community and the island's second largest city, Kaohsiung. In July we arrived just as the powerful Typhoon Soulik touched down in Tapai. This turned into an important part of the design and understanding of this region. The design of the park echoes influences and inputs from many sources both known and unknown. The overall design is inspired by a long chamber shell that we saw on the 5th day of the trip at the Shell Museum in Cijin. The park is a large earthen mound sloping up over 12 feet toward the center, and the overall diameter of the area is 50 feet. A central bench invites you to move towards the ocean, passing through a tight center between 12'-high walls. This area then opens up to another bench and the pearl, as well as a clear view of the Pacific. The vertical walls of the mound are covered by mosaics of red clay bricks that come from one of the oldest kilns in the region. During the closing ceremony the students preformed an opera they created showing how nature, (specifically a typhoon in this story), can either divide us or bring us together.